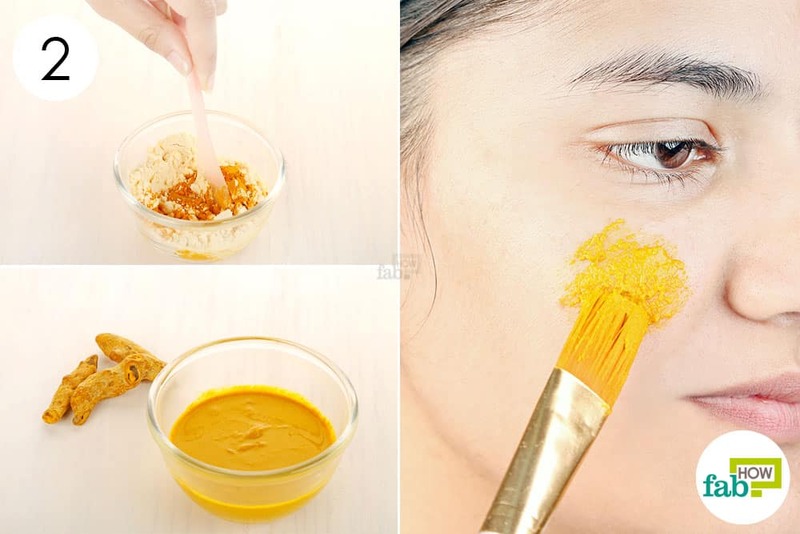 Turmeric is an age-old beauty secret of Indian women, especially would-be brides. It has been used to get rid of scars and blemishes, remove tanning, treat stubborn acne and give your skin a natural glow. This beauty secret is no longer limited to just India. 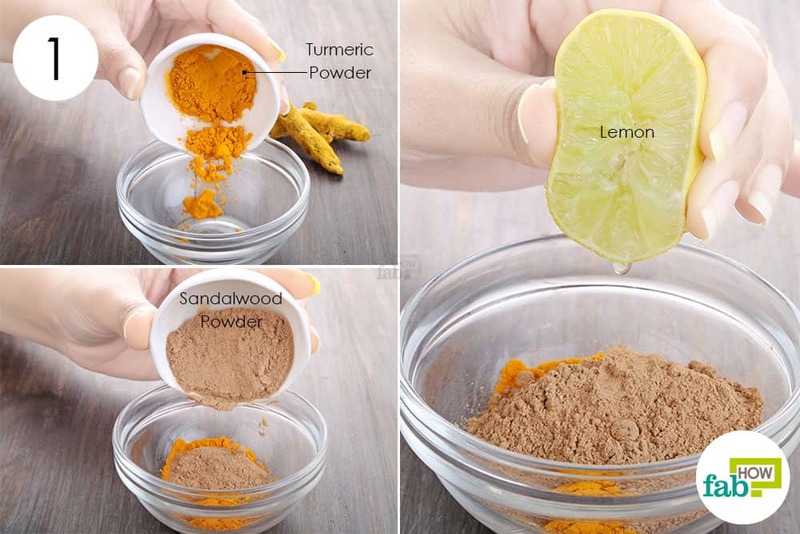 The bright yellow spice can now be found in almost every household across the globe, not only for making delectable curries but also to reap its many health and beauty benefits. 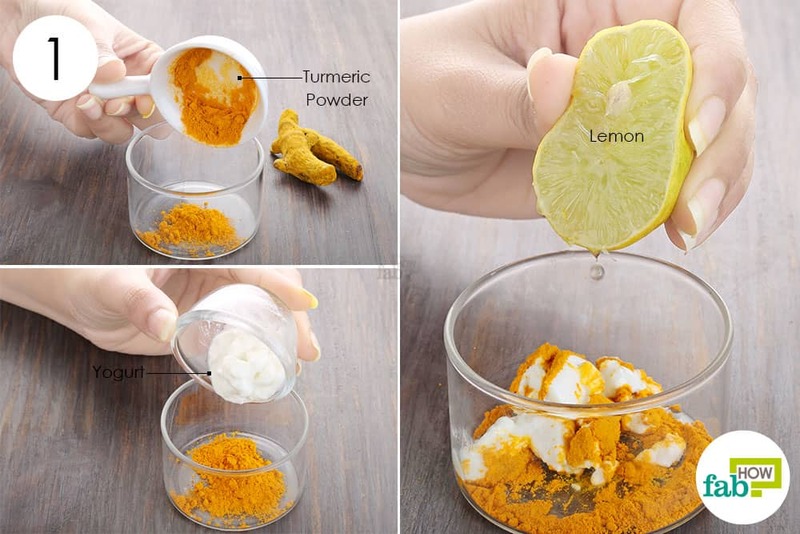 The active compound curcumin in turmeric imparts excellent antiseptic and anti-inflammatory properties, which are increasingly being explored and validated in research studies. The antioxidants in turmeric also help fight signs of aging and brighten your skin complexion over time. Another article on our site describes how to use turmeric for health benefits. Here, we’ll explain how to use this ‘superfood’ to up your beauty game. 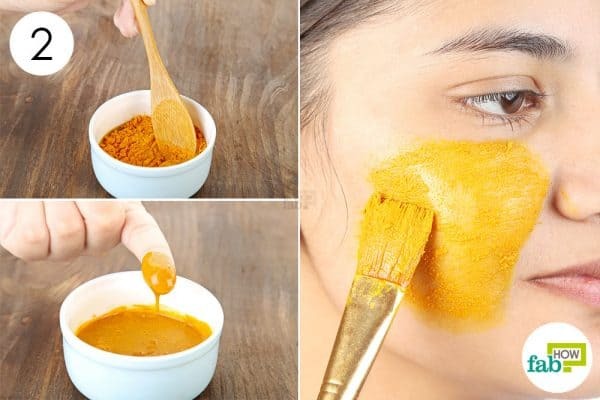 Here are 11 ways in which you can use turmeric for acne, wrinkles, skin lightening and more. Excess melanin production in the skin causes dark spots and uneven patches. The medical term for this problem is hyperpigmentation. The curcumin found in turmeric is known to reduce dark spots and lighten the skin naturally. Combining turmeric powder and honey will help keep your skin moisturized, and ensure faster and healthier skin renewal. Mix the two ingredients well to form a lump-free paste. Apply it to the affected skin and leave it on for 20 minutes. Rinse it off with warm water and apply a moisturizer. 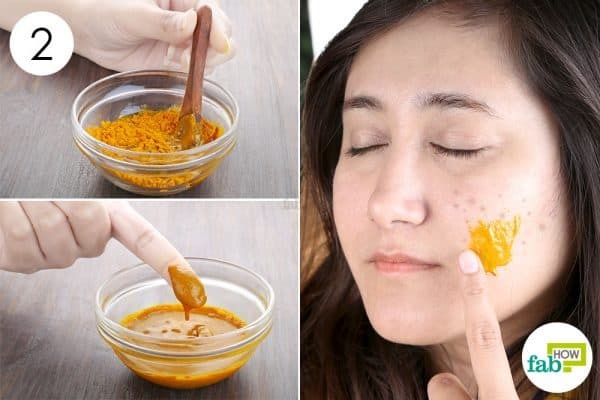 Use this mask once daily and use turmeric to get rid of dark spots naturally. Depending upon the degree of pigmentation, it can take 1 to 2 months to get palpable results. Acne can be a persistent problem if you have oily skin. 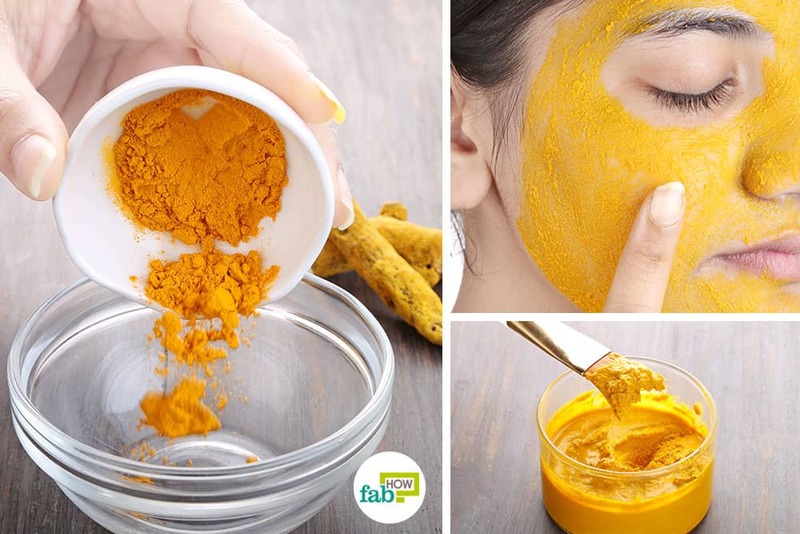 Turmeric, along with gram flour and rose water, can be whipped up into an effective anti-acne face mask. 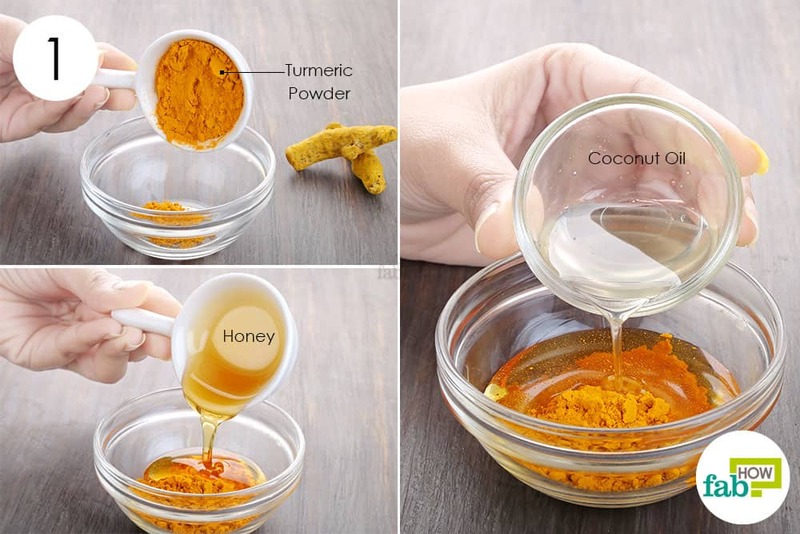 The turmeric powder works as an antimicrobial and anti-inflammatory agent on the acne. The gram flour helps absorb excess sebum from the pores. 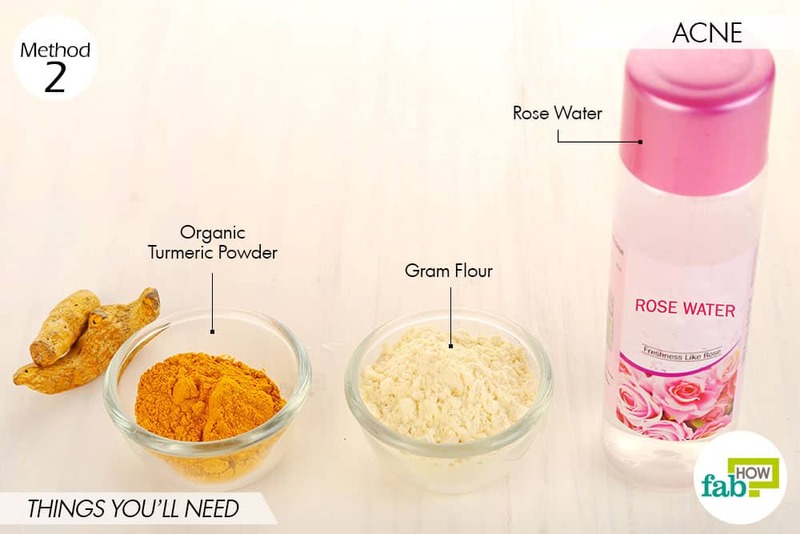 The rose water works as a mild toner to balance the pH of the skin to prevent further breakouts. 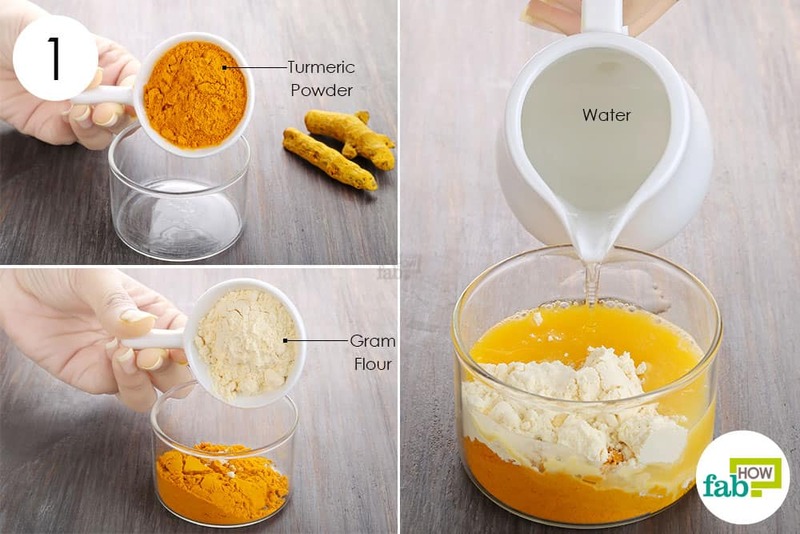 Put 1 tablespoon of organic turmeric powder in a mixing bowl. Add enough rose water to form a thick paste. If you wish, you can even learn how to make homemade rose water. Mix all the ingredients well until you get a smooth paste for application. Leave it on for 10 to 15 minutes, then wash it off with cold water. Gently pat dry your skin and apply a light, oil-free moisturizer. 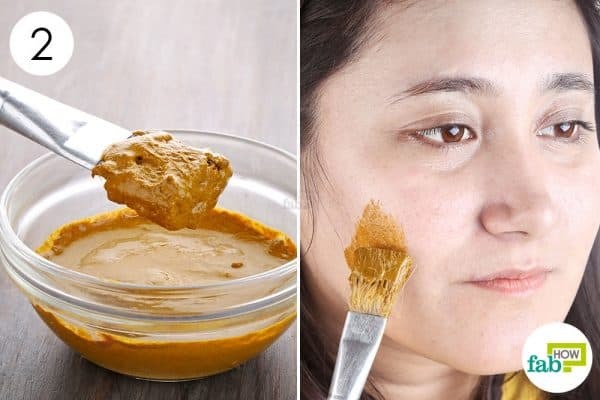 Apply this face pack twice a week for 2 to 3 weeks to treat your acne and keep pimples at bay. 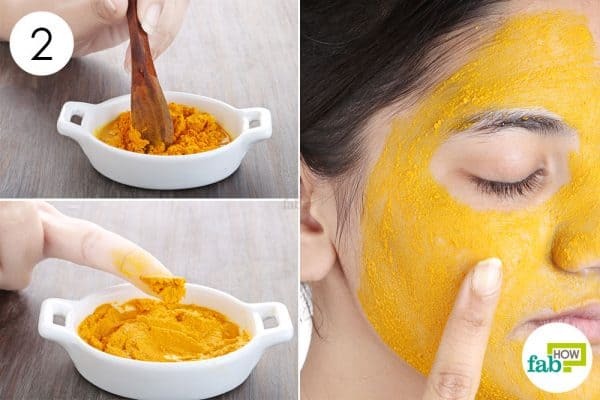 Turmeric is most popularly used as a skin-lightening agent, especially in the Indian subcontinent. You can make a lightening mask by combining turmeric with lemon juice. Lemon works as a natural bleach to lighten dark spots. Both ingredients are also antibacterial and help prevent skin infections. Note: Since lemon can make your skin photosensitive, avoid going out in the sun after applying this mask. Preferably use this mask after sundown. Put 1 teaspoon of turmeric powder in a mixing bowl. Squeeze fresh lemon juice over it. Use enough juice to form a thick paste. Mix the two ingredients well. You can add in a few drops of water to improve the consistency. Apply a thin, even layer of paste all over your face and neck. Leave it on for 20 minutes, then rinse it off with water. Apply the face mask twice weekly at least for 1 month to lighten your skin. 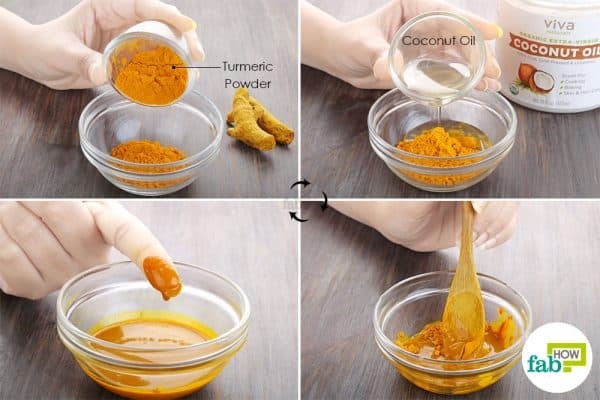 Turmeric can also be used to successfully get rid of scars that just don’t seem to budge. 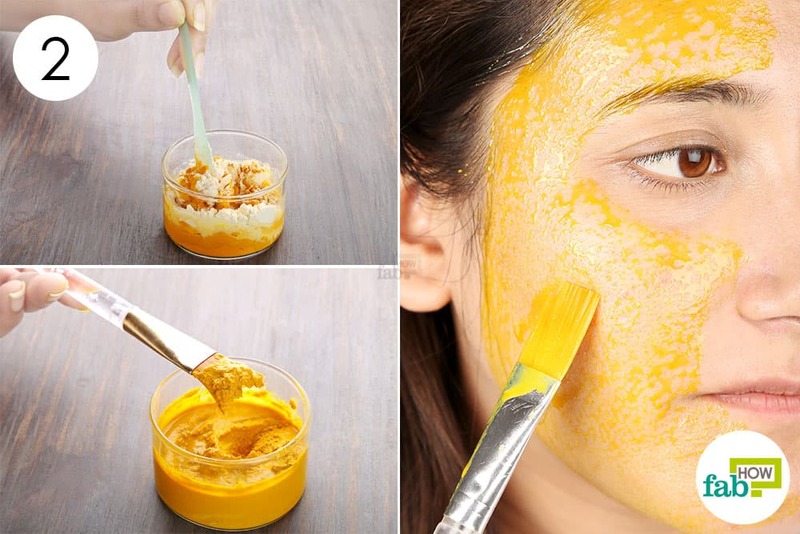 Combining it with lemon juice and sandalwood powder makes a great face mask to deal with scarring. Turmeric helps promote regeneration of healthy skin. The lemon juice is rich in vitamin C, which not only works as a bleaching agent but also boosts collagen production to renew scarred skin. Sandalwood soothes inflammation. Put 1 teaspoon of organic turmeric powder in a mixing bowl. 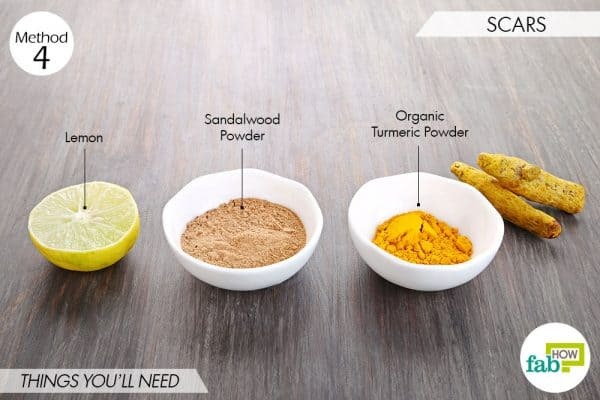 Add 1 tablespoon each of sandalwood powder and fresh lemon juice. Apply the paste to acne scars and massage for 1 to 2 minutes. Let the paste sit on the scar for 30 minutes, then rinse it off with water. Pat dry and apply a light moisturizer. Apply once daily until the scar has faded satisfactorily. Dark spots are a common skin malady faced by people who suffer from acne and blemishes or have a darker skin tone. 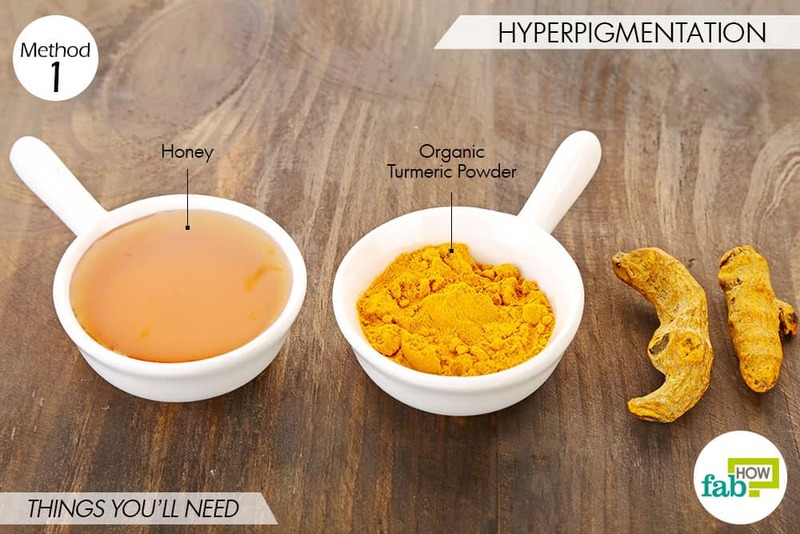 Turmeric can help you get rid of the dark spots by inhibiting skin pigmentation. 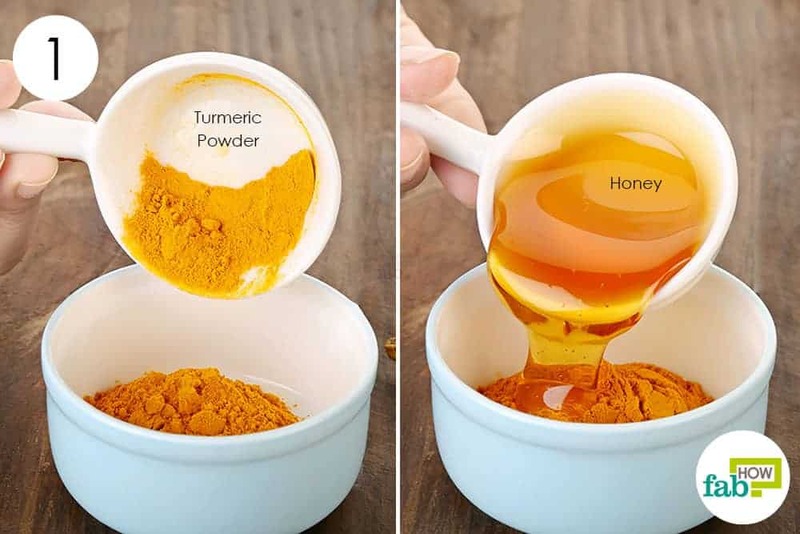 Combine it with honey to form an antibacterial and anti-inflammatory layer on the skin. This remedy also uses coconut oil to deeply nourish the skin and aid faster renewal. 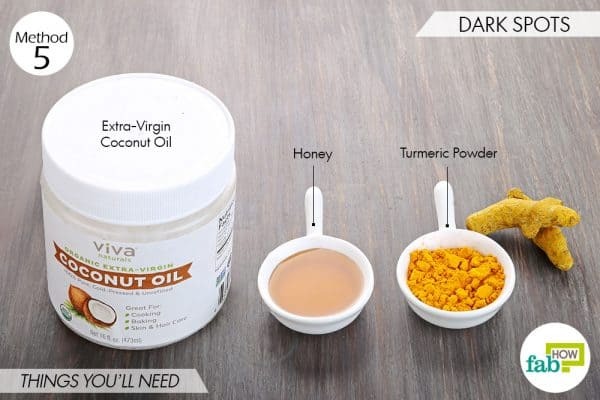 Add 1 tablespoon each of honey and extra-virgin coconut oil. Use the paste as a spot treatment or apply it all over your face. Let it sit for 20 minutes, then rinse it off with warm water. Pat dry your skin and finish by applying a light moisturizer. Use it once daily for at least 2 weeks to improve the appearance of your dark spots. The antioxidants found in turmeric help protect your skin against free-radical damage and reduce signs of aging. 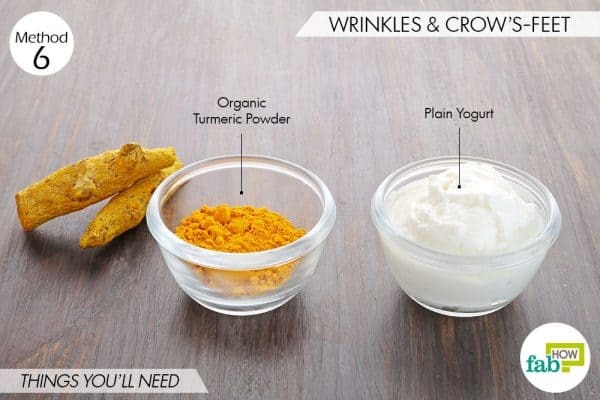 To use it to reduce or get rid of wrinkles and crow’s-feet, combine turmeric powder with some plain yogurt. The yogurt contains lactic acid that helps slough off dead skin cells to give you clean and firm-looking skin. Mix ¼ tablespoon of organic turmeric powder and 1 tablespoon of plain yogurt in a bowl. Apply it on the wrinkled skin. Use this mask 2 or 3 times a week for 1 month to notice a visible improvement in your skin. Ditch those expensive glow masks and gels for this amazingly simple turmeric face mask to get smooth, clear, and glowing skin. This mask uses turmeric along with gram flour and olive oil. The antioxidants present in turmeric will help heal all skin troubles and give you glowing and younger-looking skin. The gram flour will slough off dead skin cells, while the olive oil will deeply moisturize the skin and nourish it with essential amino acids. 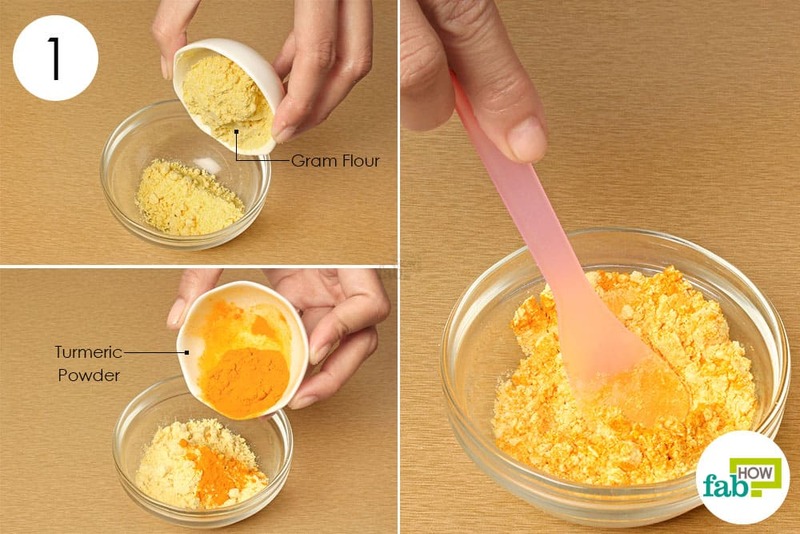 Put 1 tablespoon of gram flour in a bowl. Add 1 teaspoon of turmeric powder and mix the two well. 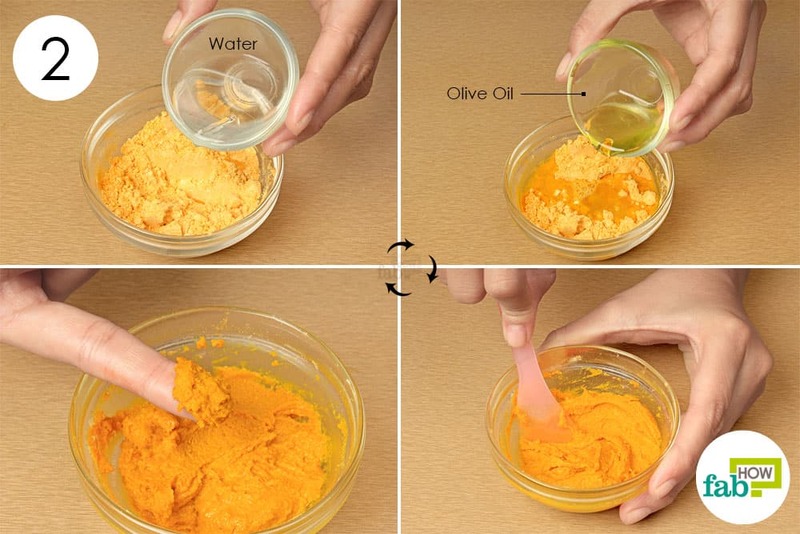 Add 1 tablespoon of water and 1 teaspoon of olive oil to the dry mixture. Mix everything until you have a smooth paste. Apply the mask all over your face and neck, avoiding the eye area. Let the mixture dry completely, then rinse it off with warm water. 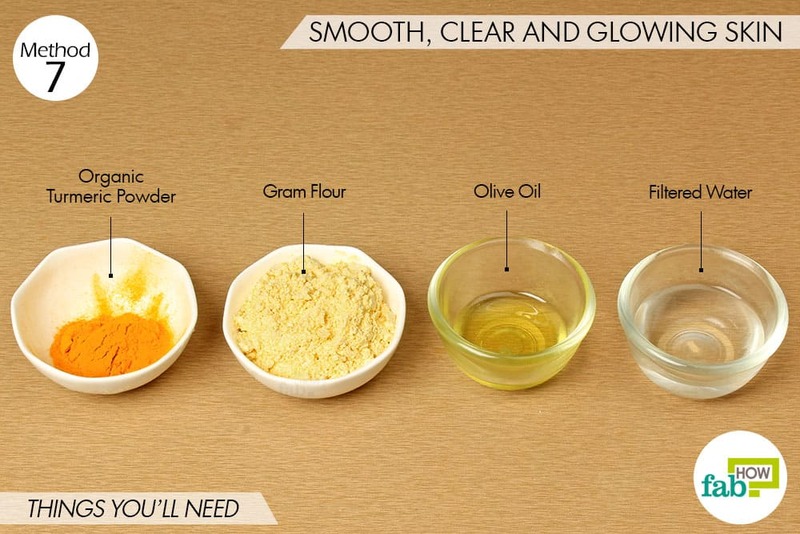 Use this mask twice every week to get smooth and glowing skin. If your skin produces a lot of natural oil, it can clog your pores and give way to pimples and acne. 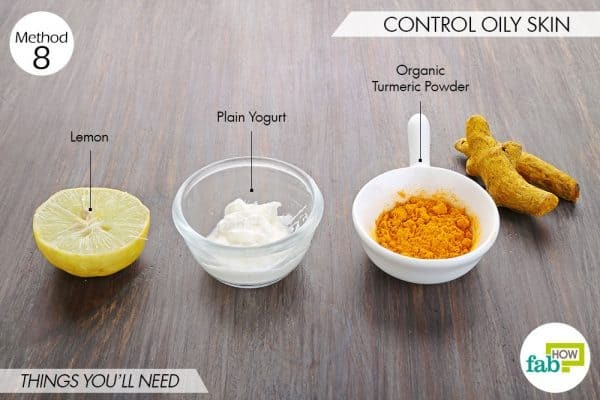 You can use turmeric, along with lemon and yogurt, to unclog your pores and reduce your oily skin. 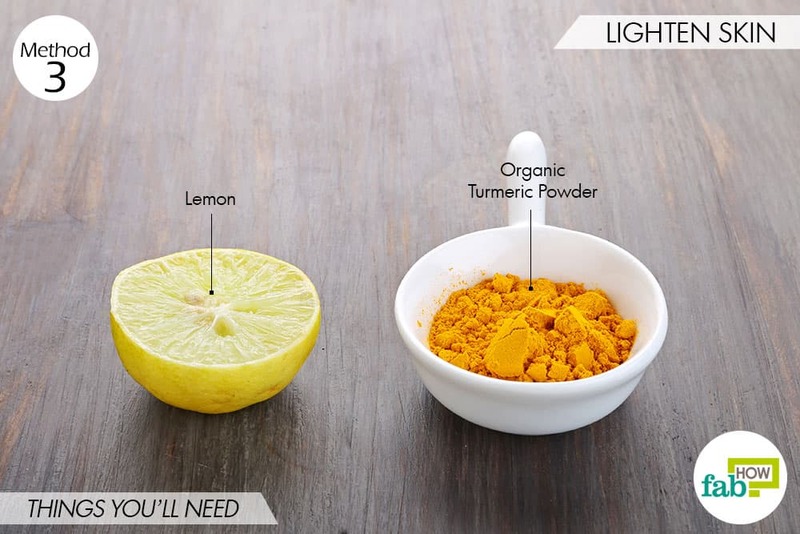 The lemon helps cut through the natural oil, while the turmeric regulates oil secretion. Yogurt works as an astringent to shrink the pores. 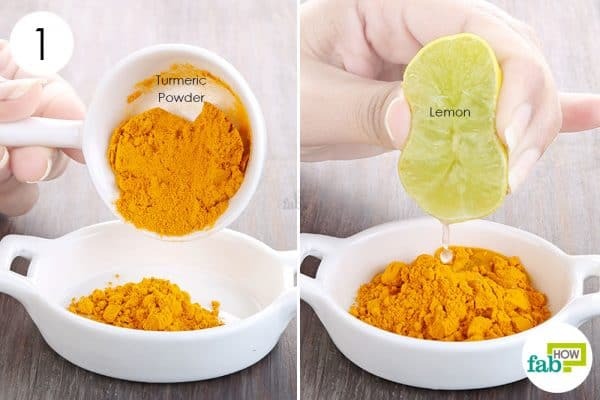 Put ½ a teaspoon of turmeric powder in a bowl. Add 1 teaspoon each of plain yogurt and fresh lemon juice. Apply an even layer of the mask on your clean face. Avoid the eye area. Let the mask work for 30 minutes, then rinse it off with warm water. Use this mask twice every week to keep your oily skin in check. If you are suffering from painful cracked heels, turmeric can bring you immense relief. Combining it with coconut oil will not only soothe but also help heal your cracked and dry heels. 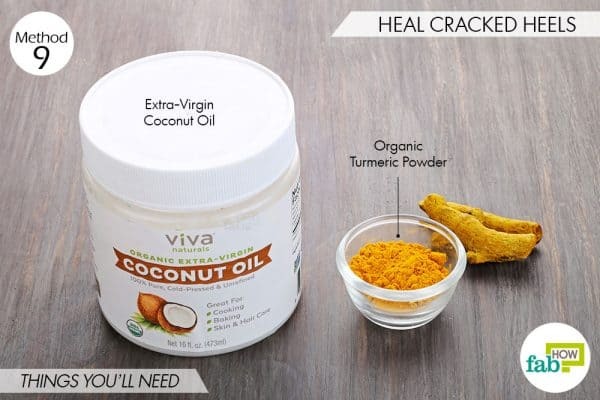 Turmeric works as an anti-inflammatory agent to reduce pain, and the coconut oil seeps into the skin and softens the cracks for faster recovery. Both ingredients are also antimicrobial and will prevent any fungal infection from developing. Mix 1 tablespoon of turmeric powder and a few drops of coconut oil to form a paste. 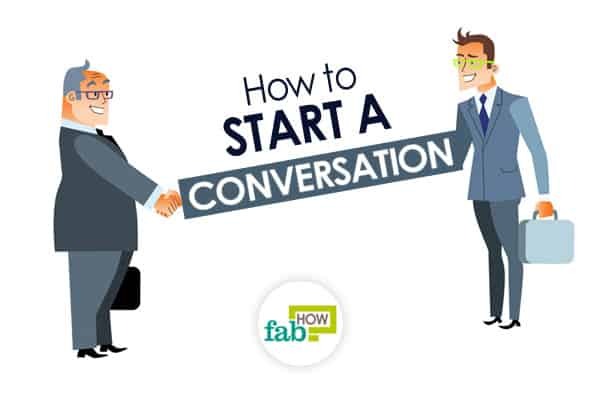 Apply the paste to your cracked heels. Make sure to fill in the cracks with the paste. Wrap your heels with a bandage to avoid staining the floor or your clothes. Let it sit for 20 to 30 minutes, then wash off the paste with warm water and a mild soap. Use this remedy daily until your heels become soft and smooth. 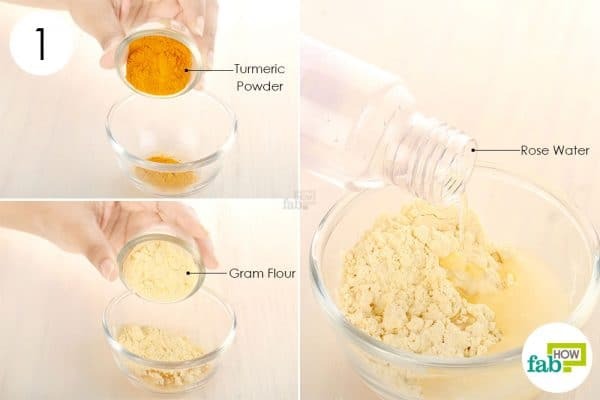 Turmeric can be combined with gram flour to get rid of unwanted facial hair. These two ingredients stick to the tiny hairs on your face and the process of scrubbing pulls out the hair along with the dried face pack. 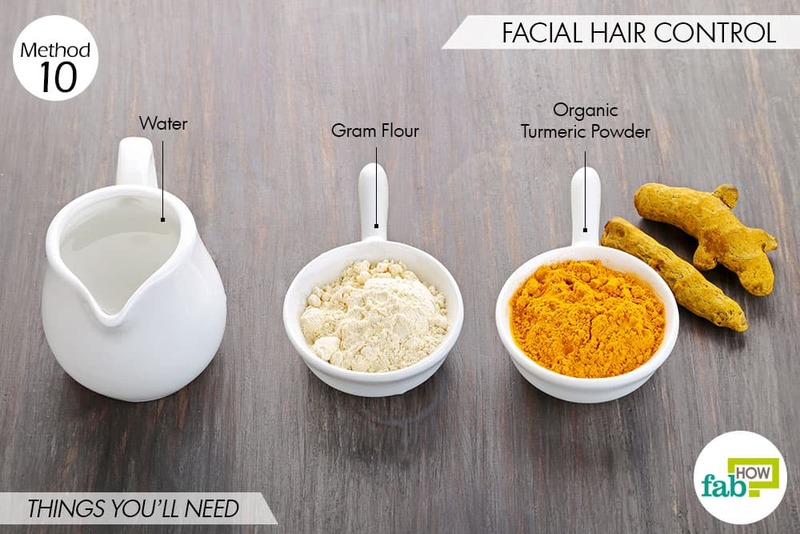 Turmeric also helps shrink the hair follicles over time, curbing the regrowth of facial hair. In addition, the gram flour acts as a natural exfoliator to slough off dead skin. Add 1 tablespoon of gram flour. Add enough water to form a thick paste. Mix the ingredients well to get a thick, lump-free paste. Apply a thick layer of the paste all over your face and let it dry completely. Soak a clean washcloth in warm water and use it to wipe off the face mask. Apply this mask 2 or 3 times a week until you get rid of the facial hair. Eczema is an inflammatory condition that leads to painful dry, red and itchy skin. 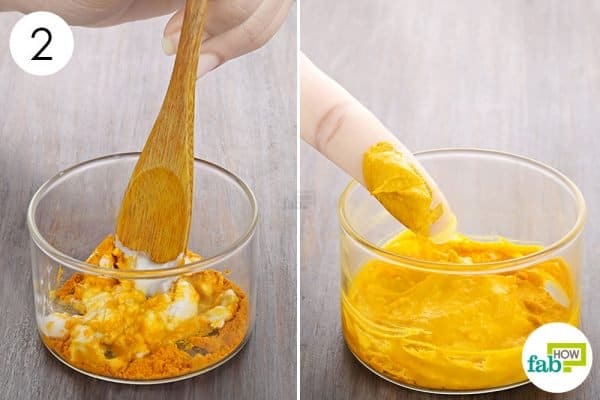 A mix of turmeric along with coconut oil can be applied to the affected skin to get immediate relief from the itching and mild pain and to cure eczema eventually. Turmeric is an excellent anti-inflammatory agent and will help in the regeneration of healthy skin. Coconut oil will keep the skin moisturized and prevent itching. Both ingredients are also antimicrobial and will kill any infection that might be causing eczema. Mix 1 teaspoon of turmeric powder and 1½ teaspoons of extra-virgin coconut oil in a bowl. Apply it to the eczema patches. Leave it on for 15 to 20 minutes, then rinse it off with water. Repeat several times throughout the day to control the pain and itching. Use it regularly until your eczema is completely healed. Turmeric can leave a bright yellow stain on everything it touches. So, use it carefully to avoid contact with your clothes. If you already managed to get a stain, check out our hacks for how to get a turmeric stain out of clothes. Turmeric will also stain your skin, but you need not worry as the stains will fade away in 1 or 2 days. If you need to get it out quickly, simply apply some coconut oil on the skin and wipe it off with a towel. Do not go overboard with turmeric to achieve quicker results, as you’ll only end up with a strong yellow stain. Use only the specified quantities for any of the remedies to get the best results. 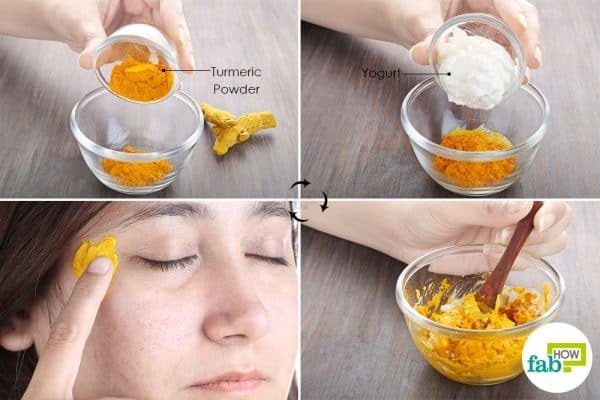 Use organic turmeric powder only for these home remedies. The commonly found turmeric contains impurities and preservatives that won’t give you the same results.